The Gregorian calendar is the internationally accepted civil calendar. It was first proposed by the Calabrian doctor Aloysius Lilius, and decreed by Pope Gregory XIII, after whom the calendar was named, on 24 February 1582 by the papal bull Inter gravissimas. It was adopted later that year by a handful of countries, with other countries adopting it over the following centuries. It is a reform of the Julian calendar. Gregory's bull does not ordain any particular year-numbering system, but uses the Anno Domini system which counts years from the traditional Incarnation of Jesus, and which had spread throughout Europe during the Middle Ages. That is the same year-numbering system that is the de facto international standard today. Every year that is exactly divisible by four is a leap year, except for years that are exactly divisible by 100; the centurial years that are exactly divisible by 400 are still leap years. For example, the year 1900 is not a leap year; the year 2000 is a leap year. The Gregorian solar calendar is an arithmetical calendar. It counts days as the basic unit of time, grouping them into years of 365 or 366 days; and repeats completely every 146,097 days, which fill 400 years, and which also happens to be 20,871 seven-day weeks. Of these 400 years, 303 (the "common years") have 365 days, and 97 (the leap years) have 366 days. This gives an average year length of exactly 365.2425 days, or 365 days, 5 hours, 49 minutes and 12 seconds. Leap years add a 29th day to February, which normally has 28 days. The essential ongoing differentiating feature of the Gregorian calendar, as distinct from the Julian calendar with a leap day every four years, is that the Gregorian omits 3 leap days every 400 years. This difference would have been more noticeable in modern memory were it not that the year 2000 was a leap year in both the Julian and Gregorian calendar systems. The intercalary day in a leap year is known as a leap day. Since Roman times 24 February (bissextile) was counted as the leap day, but now 29 February is regarded as the leap day in most countries. The Catholic Church maintained a tabular lunar calendar, which was primarily to calculate the date of Easter, and the lunar calendar required reform as well. A perpetual lunar calendar was created, in the sense that 30 different arrangements (lines in the expanded table of epacts) for lunar months were created. One of the 30 arrangements applies to a century (for this purpose, the century begins with a year divisible by 100). When the arrangement to be used for a given century is communicated, anyone in possession of the tables can find the age of the moon on any date, and calculate the date of Easter. The motivation of the Catholic Church in adjusting the calendar was to celebrate Easter at the time it thought the First Council of Nicaea had agreed upon in 325. Although a canon of the council implies that all churches used the same Easter, they did not. The Church of Alexandria celebrated Easter on the Sunday after the 14th day of the moon (computed using the Metonic cycle) that falls on or after the vernal equinox, which they placed on 21 March. However, the Church of Rome still regarded 25 March as the equinox (until 342) and used a different cycle to compute the day of the moon. In the Alexandrian system, since the 14th day of the Easter moon could fall at earliest on 21 March its first day could fall no earlier than 8 March and no later than 5 April. This meant that Easter varied between 22 March and 25 April. In Rome, Easter was not allowed to fall later than 21 April, that being the day of the Parilia or birthday of Rome and a pagan festival. The first day of the Easter moon could fall no earlier than 5 March and no later than 2 April. Easter was the Sunday after the 15th day of this moon, whose 14th day was allowed to precede the equinox. Where the two systems produced different dates there was generally a compromise so that both churches were able to celebrate on the same day. By the tenth century all churches (except some on the eastern border of the Byzantine Empire) had adopted the Alexandrian Easter, which still placed the vernal equinox on 21 March, although Bede had already noted its drift in 725—it had drifted even further by the sixteenth century. The fix was to come in two stages. First, it was necessary to approximate the correct length of a solar year. The value chosen was 365.2425 days in decimal notation. Although close to the mean tropical year of 365.24219 days, it is even closer to the vernal equinox year of 365.2424 days; this fact made the choice of approximation particularly appropriate as the purpose of creating the calendar was to ensure that the vernal equinox would be near a specific date (21 March). (See Accuracy). In 1577 a Compendium was sent to expert mathematicians outside the reform commission for comments. Some of these experts, including Giambattista Benedetti and Giuseppe Moleto, believed Easter should be computed from the true motions of the sun and moon, rather than using a tabular method, but these recommendations were not adopted. Gregory dropped 10 days to bring the calendar back into synchronization with the seasons. Lilius originally proposed that the 10-day correction should be implemented by deleting the Julian leap day on each of its ten occurrences during a period of 40 years, thereby providing for a gradual return of the equinox to 21 March. However, Clavius's opinion was that the correction should take place in one move and it was this advice which prevailed with Gregory. Accordingly, when the new calendar was put in use, the error accumulated in the 13 centuries since the Council of Nicaea was corrected by a deletion of ten days. The last day of the Julian calendar was Thursday, 4 October 1582 and this was followed by the first day of the Gregorian calendar, Friday, 15 October 1582 (the cycle of weekdays was not affected). Though Gregory's reform was enacted in the most solemn of forms available to the Church, in fact the bull had no authority beyond the Catholic Church and the Papal States . The changes which he was proposing were changes to the civil calendar over which he had no authority. The changes required adoption by the civil authorities in each country to have legal effect. The Nicene Council of 325 sought to devise rules whereby all Christians would celebrate Easter on the same day. In fact it took a very long time before Christians achieved that objective (see Easter for the issues which arose). However, the bull Inter gravissimas became the law of the Catholic Church. It was not recognised, however, by Protestant Churches nor by Orthodox Churches and others. Consequently, the days on which Easter and related holidays were celebrated by different Christian Churches again diverged. Only four Catholic countries adopted the new calendar on the date specified by the bull. Other Catholic countries experienced some delay before adopting the reform; and non-Catholic countries, not being subject to the decrees of the Pope, initially rejected or simply ignored the reform altogether, although they all eventually adopted it. Hence, the dates 5 October 1582 to 14 October 1582 (inclusive) are valid dates in many countries. Spain , Portugal , the Polish-Lithuanian Commonwealth, and most of Italy implemented the new calendar on Friday, 15 October 1582, following Julian Thursday, 4 October 1582. The Spanish and Portuguese colonies adopted the calendar later because of the slowness of communication. France adopted the new calendar on Monday, 20 December 1582, following Sunday, 9 December 1582. The Dutch provinces of Brabant, Zeeland and the Staten-Generaal also adopted it on 25 December of that year, the provinces forming the Southern Netherlands (modern Belgium) on 1 January 1583, and the province of Holland followed suit on 12 January 1583. Many Protestant countries initially objected to adopting a Catholic invention; some Protestants feared the new calendar was part of a plot to return them to the Catholic fold. In the Czech lands, Protestants resisted the calendar imposed by the Habsburg Monarchy. In parts of Ireland , Catholic rebels until their defeat in the Nine Years' War kept the "new" Easter in defiance of the English-loyal authorities; later, Catholics practising in secret petitioned the Propaganda Fide for dispensation from observing the new calendar, as it signalled their disloyalty. Denmark , which then included Norway and some Protestant states of Germany , adopted the solar portion of the new calendar on Monday, 1 March 1700, following Sunday, 18 February 1700, because of the influence of Ole Rømer, but did not adopt the lunar portion. Instead, they decided to calculate the date of Easter astronomically using the instant of the vernal equinox and the full moon according to Kepler's Rudolphine Tables of 1627. They finally adopted the lunar portion of the Gregorian calendar in 1776. The remaining provinces of the Dutch Republic also adopted the Gregorian calendar in July 1700 (Gelderland), December 1700 (Utrecht and Overijssel) and January 1701 (Friesland and Groningen). Sweden 's relationship with the Gregorian Calendar was a difficult one. Sweden started to make the change from the Julian calendar and towards the Gregorian calendar in 1700, but it was decided to make the (then 11-day) adjustment gradually, by excluding the leap days (29 February) from each of 11 successive leap years, 1700 to 1740. In the meantime, the Swedish calendar would be out of step with both the Julian calendar and the Gregorian calendar for 40 years; also, the difference would not be constant but would change every 4 years. This strange system clearly had great potential for endless confusion when working out the dates of Swedish events in this 40-year period. To make matters worse, the system was poorly administered and the leap days that should have been excluded from 1704 and 1708 were not excluded. The Swedish calendar (according to the transition plan) should now have been 8 days behind the Gregorian, but was still in fact 10 days behind. King Charles XII recognised that the gradual change to the new system was not working, and he abandoned it. However, rather than proceeding directly to the Gregorian calendar, it was decided to revert to the Julian calendar. This was achieved by introducing the unique date 30 February in the year 1712, adjusting the discrepancy in the calendars from 10 back to 11 days. Sweden finally adopted the Gregorian calendar in 1753, when Wednesday, 17 February was followed by Thursday, 1 March. Since Finland was under Swedish rule at that time, it did the same. Britain and the British Empire (including the eastern part of what is now the United States ) adopted the Gregorian calendar in 1752 by which time it was necessary to correct by 11 days. Wednesday, 2 September 1752 was followed by Thursday, 14 September 1752 to account for 29 February 1700 (Julian). Claims that rioters demanded "Give us our eleven days" grew out of a misinterpretation of a painting by William Hogarth. After 1753, the British tax year in Britain continued to operate on the Julian calendar and began on 5 April, which was the "Old Style" new tax year of 25 March. A 12th skipped Julian leap day in 1800 changed its start to 6 April. It was not changed when a 13th Julian leap day was skipped in 1900, so the tax year in the United Kingdom still begins on 6 April. In Alaska , the change took place when Friday, 6 October 1867 was followed again by Friday, 18 October after the US purchase of Alaska from Russia, which was still on the Julian calendar. Instead of 12 days, only 11 were skipped, and the day of the week was repeated on successive days, because the International Date Line was shifted from Alaska's eastern to western boundary along with the change to the Gregorian calendar. In Russia the Gregorian calendar was accepted after the October Revolution (so named because it took place in October 1917 in the Julian calendar). On 24 January 1918 the Council of People's Commissars issued a Decree that Wednesday, 31 January 1918 was to be followed by Thursday, 14 February 1918. The last country of Eastern Orthodox Europe to adopt the Gregorian calendar was Greece on Thursday, 1 March 1923, following Wednesday, 15 February 1923. Japan , the first eastern Asia country adopting the western calendar, replaced its traditional lunisolar calendar with the Gregorian calendar on 1 January 1873, and changed its traditional month names into numbered months, but continued to use Gengo, reign names, instead of the Common Era or Anno Domini system: Meiji 1=1868, Taisho 1=1912, Showa 1=1926, Heisei 1=1989, and so on. The "Western calendar" (西暦, seireki) using western year numbers, is also widely accepted by civilians and to a lesser extent by government agencies. The Republic of China (ROC) formally adopted the Gregorian calendar at its founding on 1 January 1912, but China soon descended into a period of warlordism with different warlords using different calendars. With the unification of China under the Kuomintang in October 1928, the Nationalist Government decreed that effective 1 January 1929 the Gregorian calendar would be used. However, China retained the Chinese traditions of numbering the months and a modified Era System, backdating the first year of the ROC to 1912; this system is still in use in Taiwan where this ROC government retains control. Upon its foundation in 1949, the People's Republic of China continued to use the Gregorian calendar with numbered months, but abolished the ROC Era System and adopted Western numbered years. In 1645, the director of the Bureau of Astronomy and Meteorology Kim Yuk (1580-1658) "successfully urged the throne to adopt the Western methods of calendrical science. As a result, "Korea began calculating its calendar with those new techniques in 1653." Korea continued to primarily utilize the lunisolar Korean calendar that was based on the lunisolar Chinese calendar. Despite all the civil adoptions, none of the national Orthodox Churches have recognized it for church or religious purposes. Instead, a Revised Julian calendar was proposed in May 1923 which dropped 13 days in 1923 and adopted a different leap year rule. There will be no difference between the two calendars until 2800. The Orthodox churches of Constantinople , Alexandria, Antioch, Greece, Cyprus, Romania, and Bulgaria adopted the Revised Julian calendar, so until 2800 these New calendarists would celebrate Christmas on 25 December in the Gregorian calendar, the same day as the Western churches. The Orthodox churches of Jerusalem, Russia, Serbia, the Republic of Macedonia, Georgia, Poland and the Greek Old Calendarists did not accept the Revised Julian calendar, and continue to celebrate Christmas on 25 December in the Julian calendar, which is 7 January in the Gregorian calendar until 2100. The refusal to accept the Gregorian reforms also has an impact on the date of Easter. This is because the date of Easter is determined with reference to 21 March as the functional equinox, which continues to apply in the Julian calendar, even though the civil calendar in the native countries now use the Gregorian calendar. All of the other Eastern churches, the Oriental Orthodox churches (Coptic, Ethiopian, Eritrean, Syrian and the Armenian Apostolic Church) continue to use their own calendars, which usually result in fixed dates being celebrated in accordance with the Julian calendar but the Assyrian Church uses the Gregorian Calendar as enacted by Mar Dinkha, causing a schism; the Ancient Assyrian Church of the East continues to use the Julian Calendar. All Eastern churches continue to use the Julian Easter with the sole exception of the Finnish Orthodox Church, which has adopted the Gregorian Easter. from:1582  till:1582  text:"1582~France, Netherlands (Brabant, Zeeland and the Staten-Generaal), Savoy, Luxembourg"
from:1583  till:1583  text:"1583~Austria, Netherlands (Holland and modern Belgium), Catholic Switzerland and Germany"
from:1753  till:1753  text:"1753~Sweden (incl. Finland)"
from:1752  till:1752  text:"1752~Great Britain and its possessions"
from:1760  till:1760  text:"1760~Lorraine (Habsburg -> France)"
from:1584  till:1584  text:"1584~Bohemia and Moravia"
from:1811  till:1811  text:"1811~Swiss canton of Grisons"
from:1867  till:1867  text:"1867~Alaska (Russia -> USA)"
Note that the difference is not well defined when it spans the end of a February that has a different number of days in the two calendars. Therefore such dates are excluded from the table. The ancient Roman calendar started its year on 1 March. The year used in dates during the Roman Republic and the Roman Empire was the consular year, which began on the day when consuls first entered office — probably 1 May before 222 BC, 15 March from 222 BC and 1 January from 153 BC. In 45 BC, Julius Caesar introduced the Julian calendar, which continued to use 1 January as the first day of the new year. Even though the year used for dates changed, the civil year always displayed its months in the order January through December from the Roman Republican period until the present. During the Middle Ages, under the influence of the Christian Church, many Western European countries moved the start of the year to one of several important Christian festivals — 25 December (the Nativity of Jesus), 25 March (Annunciation), or Easter (France ), while the Byzantine Empire began its year on 1 September and Russia did so on 1 March until 1492 when the year was moved to 1 September. In common usage, 1 January was regarded as New Year's Day and celebrated as such, but from the 12th century until 1751 the legal year in England began on 25 March (Lady Day).Nørby, Toke. The Perpetual Calendar: What about England Version 29 February 2000 So, for example, the Parliamentary record records the execution of Charles I occurring in 1648 (as the year did not end until 24 March), although modern histories adjust the start of the year to 1 January and record the execution as occurring in 1649. Most Western European countries changed the start of the year to 1 January before they adopted the Gregorian calendar. For example, Scotland changed the start of the Scottish New Year to 1 January in 1600 (this means that 1599 was a short year). England, Ireland and the British colonies changed the start of the year to 1 January in 1752 (so 1751 was a short year with only 282 days). Later that year in September the Gregorian calendar was introduced throughout Britain and the British colonies (see the section Adoption). These two reforms were implemented by the Calendar Act 1750. In some countries, an official decree or law specified that the start of the year should be 1 January. For such countries we can identify a specific year when a 1 January-year became the norm. But in other countries the customs varied, and the start of the year moved back and forth as fashion and influence from other countries dictated various customs. Neither the papal bull nor its attached canons explicitly fix such a date, though it is implied by two tables of saint's days, one labeled 1582 which ends on 31 December, and another for any full year that begins on 1 January. It also specifies its epact relative to 1 January, in contrast with the Julian calendar, which specified it relative to 22 March. These would have been the inevitable result of the above shift in the beginning of the Julian year. During the period between 1582, when the first countries adopted the Gregorian calendar, and 1923, when the last European country adopted it, it was often necessary to indicate the date of some event in both the Julian calendar and in the Gregorian calendar, for example, "10/21 February 1750/51", where the dual year accounts for some countries already beginning their numbered year on 1 January while others were still using some other date. Even before 1582, the year sometimes had to be double dated because of the different beginnings of the year in various countries. Woolley, writing in his biography of John Dee (1527–1608/9), notes that immediately after 1582 English letter writers "customarily" used "two dates" on their letters, one OS and one NS. "Old Style" (OS) and "New Style" (NS) are sometimes added to dates to identify which system is used in the British Empire and other countries that did not immediately change. Because the Calendar Act of 1750 altered the start of the year, and also aligned the British calendar with the Gregorian calendar, there is some confusion as to what these terms mean. They can indicate that the start of the Julian year has been adjusted to start on 1 January (NS) even though contemporary documents use a different start of year (OS); or to indicate that a date conforms to the Julian calendar (OS), formerly in use in many countries, rather than the Gregorian calendar (NS). Death warrant of Charles I web page of the UK National Archives. A demonstration of New Style meaning Julian calendar with a start of year adjustment. The October (November) Revolution Britannica encyclopaedia, A demonstration of New Style meaning the Gregorian calendar. There was a great deal of confusion when the calendar changed, and the confusion continues today. In some cases, historians did not differentiate between the years, forcing some researchers to guess between two years when interpreting the information. When "translating" dates from historical documents to current documents for dates that have been incorrectly double dated by historians, both years should be entered into present-day documents until a copy of the original primary source verifies which year was written in the official record. Often errors have been perpetuated from the early 19th century and still exist today. When translating dates from historical documents to current documents for dates that have been correctly double dated by historians, the standard practice is to enter the earlier year first, and the later year second. For ordinary purposes, the dates of events occurring prior to 15 October 1582 are generally shown as they appeared in the Julian calendar, with the year starting on 1 January, and no conversion to their Gregorian equivalents. The Battle of Agincourt is universally known to have been fought on 25 October 1415 which is Saint Crispin's Day. Usually, the mapping of new dates onto old dates with a start of year adjustment works well with little confusion for events which happened before the introduction of the Gregorian Calendar. But for the period between the first introduction of the Gregorian calendar on 15 October 1582 and its introduction in Britain on 14 September 1752, there can be considerable confusion between events in continental western Europe and in British domains in English language histories. Events in continental western Europe are usually reported in English language histories as happening under the Gregorian calendar. For example the Battle of Blenheim is always given as 13 August 1704. However confusion occurs when an event affects both. For example William III of England arrived at Brixham in England on 5 November (Julian calendar), after setting sail from the Netherlands on 11 November (Gregorian calendar). Shakespeare and Cervantes apparently died on exactly the same date (23 April 1616), but in fact Cervantes predeceased Shakespeare by ten days in real time (for dating these events, Spain used the Gregorian calendar, but Britain used the Julian calendar). This coincidence, however, has allowed UNESCO to make 23 April the World Book and Copyright Day. Astronomers avoid this ambiguity by the use of the Julian day number. For dates before the year 1, unlike the proleptic Gregorian calendar used in the international standard ISO 8601, the traditional proleptic Gregorian calendar (like the Julian calendar) does not have a year 0 and instead uses the ordinal numbers 1, 2, … both for years AD and BC. Thus the traditional timeline is 2 BC, 1 BC, AD 1, and AD 2. ISO 8601 uses astronomical year numbering which includes a year 0 and negative numbers before it. Thus the ISO 8601 timeline is -0001, 0000, 0001, and 0002. For variations and alternate endings, see Thirty days hath September. A language-independent alternative used in many countries is to hold up your two fists with the index knuckle of your left hand against the index knuckle of your right hand. Then, starting with January from the little knuckle of your left hand, count knuckle, space, knuckle, space through the months. A knuckle represents a month of 31 days, and a space represents a short month (a 28- or 29-day February or any 30-day month). The junction between the hands is not counted, so the two index knuckles represent July and August. This method also works by starting the sequence on the right hand's little knuckle, and continue toward to the left. You can also use just one hand; after counting the fourth knuckle as July, start again counting the first knuckle as August. A similar mnemonic can be found on a piano keyboard: starting on the key F for January, moving up the keyboard in semitones, the black notes give the short months, the white notes the long ones. February: Februus (Etruscan god of death) Februarius (mensis) (Latin for "month of purification (rituals)" it is said to be a Sabine word, the last month of ancient pre-450 BC Roman calendar). It is related to fever. April: "Modern scholars associate the name with an ancient root meaning 'other', i.e the second month of a year beginning in March." In conjunction with the system of months there is a system of weeks. A physical or electronic calendar provides conversion from a given date to the weekday, and shows multiple dates for a given weekday and month. Calculating the day of the week is not very simple, because of the irregularities in the Gregorian system. When the Gregorian calendar was adopted by each country, the weekly cycle continued uninterrupted. So, using the original proposed adoption date, Thursday, 4 October 1582 would be followed by Friday 15 October. Since the 400-year cycle of the Gregorian calendar consists of a whole number of weeks, each cycle has a fixed distribution of weekdays among calendar dates. It then becomes possible that this distribution is not even. Indeed, because there are 97 leap years in every 400 years in the Gregorian Calendar, there are on average 13 for each starting weekday in each cycle. This already shows that the frequency is not the same for each weekday, which is due to the effects of the "common" centennial years (1700, 1800, 1900, 2100, 2200 etc.). A leap year starting on Sunday means the next year does not start on Monday, so more leap years starting on Sunday means fewer years starting on Monday, etc. Thus the pattern of number of years starting on each day is inverted and shifted by one weekday: 58, 56, 58, 57, 57, 58, 56 (symmetric with respect to the high Sunday value). The number of common years starting on each day is found by subtraction: 43, 43, 44, 43, 44, 43, 43. The Gregorian calendar improves the approximation made by the Julian calendar by skipping three Julian leap days in every 400 years, giving an average year of 365.2425 mean solar day long,. This approximation has an error of about one day per 3300 years with respect to the mean tropical year, but less than half this error with respect to the vernal equinox year of 365.24237 days. With respect to both solstices the Gregorian Calendar gives an average year length that is actually shorter than the true length. By any criterion, the Gregorian calendar is substantially more accurate than the one day in 128 years error of the Julian calendar (average year 365.25 days). In the 19th century, Sir John Herschel proposed a modification to the Gregorian calendar with 969 leap days every 4000 years, instead of 970 leap days that the Gregorian calendar would insert over the same period. This would reduce the average year to 365.24225 days. Herschel's proposal would make the year 4000, and multiples thereof, common instead of leap. While this modification has often been proposed since, it has never been officially adopted. On timescales of thousands of years, the Gregorian calendar falls behind the seasons because the slowing down of the Earth's rotation makes each day slightly longer over time (see tidal acceleration and leap second) while the year maintains a more uniform duration. Borkowski reviewed mathematical models in the literature, and found the results generally fall between a model by McCarthy and Babcock, and another by Stephenson and Morrison. If so, in the year 4000, the calendar will fall behind by at least 0.8, but less than 1.1 days. In the year 12,000 the calendar would fall behind at least 8, but less than 12 days. The y-axis and the x-axis is Gregorian calendar years. Each point is the date and time of the June Solstice on that particular year. The error shifts by about a quarter of a day per year. Centurial years are ordinary years, unless they are divisible by 400, in which case they are leap years. This causes a correction on years 1700, 1800, 1900, 2100, 2200, and 2300. Since 1972, some years may also contain one or more leap seconds, to account for cumulative irregularities in the Earth's rotation. So far, these have always been positive and have occurred on average once every 18 months. The day of the year is somewhat inconvenient to compute, partly because the leap day does not fall at the end of the year. But the calendar exhibits a repeating pattern for the number of days in the months March through July and August through December: 31, 30, 31, 30, 31, for a total of 153 days each. In fact, any five consecutive months not containing February contain exactly 153 days. The 400-year cycle of the Gregorian calendar has 146,097 days and hence exactly 20,871 weeks. So, for example, the days of the week in Gregorian 1603 were exactly the same as for 2003. The years that are divisible by 400 begin on a Saturday. In the 400-year cycle, more months begin on a Sunday (and hence have Friday the 13th) than any other day of the week (see above under Week for a more detailed explanation of how this happens). 688 out of every 4800 months (or 172/1200) begin on a Sunday, while only 684 out of every 4800 months (171/1200) begin on each of Saturday and Monday, the least common cases. Common years always begin and end on the same day of the week, since 365 is one more than a multiple of 7 (52 [number of weeks in a year] × 7 [number of days in a week] = 364). For example, 2003 began on a Wednesday and ended on a Wednesday. Leap years end on the next day of the week from which they begin. For example, 2004 began on a Thursday and ended on a Friday. Not counting leap years, any calendar date will move to the next day of the week the following year. For example, if your birthday fell on a Tuesday in 2002, it fell on a Wednesday in 2003. Leap years make things a little more complicated. 2004 was a leap year, so calendar days of 1 March or later in the year, moved two days of the week from 2003. However, calendar days occurring before 1 March do not make the extra day of the week jump until the year following a leap year. So, if your birthday is 15 June, then it must have fallen on a Sunday in 2003 and a Tuesday in 2004. If, however, your birthday is 15 February, then it must have fallen on a Saturday in 2003, a Sunday in 2004 and a Tuesday in 2005. In any year (even a leap year), July always begins on the same day of the week that April does. Therefore, the only difference between a July calendar page and an April calendar page in the same year is the extra day July has. The same relationship exists between September and December as well as between March and November. Add an extra day to the September page and you've got December. Take a day away from the March page and you've got November. In common years only, there are additional matches: October duplicates January, and March and November duplicate February in their first 28 days. In leap years only, there is a different set of additional matches: July is a duplicate of January while February is duplicated in the first 29 days of August. The Anno Domini (Latin for "in the year of the/our Lord") system of numbering years, in which the leap year rules are written, and which is generally used together with the Gregorian calendar, is also known in English as the Common Era or Christian Era. Years before the beginning of the era are known in English as Before Christ, Before the Common Era, or Before the Christian Era. The corresponding abbreviations AD, CE, BC, and BCE are used. There is no year 0; AD 1 immediately follows 1 BC. Naturally, since Inter gravissimas was written in Latin, it does not mandate any English language nomenclature. Two era names occur within the bull, "anno Incarnationis dominicæ" ("in the year of the Incarnation of the Lord") for the year it was signed, and "anno à Nativitate Domini nostri Jesu Christi" ("in the year from the Nativity of our Lord Jesus Christ") for the year it was printed. Nevertheless, "anno Domini" and its inflections "anni Domini" and "annus Domini" are used many times in the canons attached to the bull. Coyne, G. V., Hoskin, M. A., and Pedersen, O.(Eds.) (1983). Gregorian reform of the calendar: Proceedings of the Vatican conference to commemorate its 400th anniversary, 1582-1982. Vatican City: Pontifical Academy of Sciences, Specolo Vaticano. Introduction to Calendars. United States Naval Observatory. Accessed 15 January 2009. Calendars by L. E. Doggett. Section 2. The international standard for the representation of dates and times ISO 8601 uses the Gregorian calendar. Section 3.2.1. This era was created in the year 525 by the Roman monk Dionysius Exiguus. See Nineteen-Year Cycle of Dionysius. Introduction and first argumentum. Introduction to Calendars. (13 September 2007). United States Naval Observatory. "Lastly, in consideration of the quarter of a day, which he regarded as completing the true year, he established the rule that, at the end of every four years, a single day should be intercalated where the month had been hitherto inserted, that is, immediately after the terminalia; which day is now called the bissextum". Censorinus:The Natal Day. "Julius Caesar added ten days to the former number in order to complete the 365 days which the sun takes to pass through the zodiac; and to take account of the quarter of a day, he directed the pontiffs, who were entrusted with the months and days, to intercalate one day every four years in the same month and in the same place the ancients had intercalated, that is, before the last five days of February, hence this day was called bissextile." Macrobius: Saturnalia. Coyne et al. (Eds), (1993), pp. 201–224. O. Pedersen. (1983). "The ecclesiastical calendar and the life of the church." in G. V. Coyne et al., ed. 42–43. This is 365;14,33 days in sexagesimal notation—the length of the tropical year, rounded to two sexagesimal positions; this was the value used in the major astronomical tables of the day. Coyne et al. (Eds), 1983, p. 211, 214. Toke Nørby. The Perpetual Calendar: What about France? Gordon Moyer. (May 1982). "The Gregorian Calendar". Scientific American, May 1982, p. 144. Lee & de Bary 2000, 118. This is still reflected in the names of some months which derive from Latin: September (seven), October (eight), November (nine), December (ten). S.I. Seleschnikow: Wieviel Monde hat ein Jahr? (Aulis-Verlag, Leipzig/Jena/Berlin 1981, p. 149), which is a German translation of С.И. Селешников: История календаря и хронология (Издательство «Наука», Moscow 1977). The relevant chapter is available online here: История календаря в России и в СССР (Calendar history in Russia and the USSR). Anno Mundi 7000 lasted from to . Tuesday 31 December 1661, Pepys Diary "I sat down to end my journell for this year, ..."
Herluf Nielsen: Kronologi (2nd ed., Dansk Historisk Fællesforening, Copenhagen 1967), pp.48-50. Blackburn & Holford-Strevens (1999), p. 784. John J. Bond, Handy-book of rules and tables for verifying dates with the Christian era Scottish decree on pp. xvii–xviii. Roscoe Lamont, The reform of the Julian calendar, Popular Astronomy 28 (1920) 18–32. 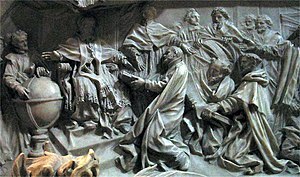 Decree of Peter the Great is on pp.23–24. In Scotland the legal start of year had been moved to 1 January in 1600 (Mike Spathaky. Old Style New Style dates and the change to the Gregorian calendar); and as Ireland was not part of the union of Great Britain so separate legislation was needed for Ireland. Spathaky, Mike Old Style New Style dates and the change to the Gregorian calendar. "increasingly parish registers, in addition to a new year heading after 24th March showing, for example '1733', had another heading at the end of the following December indicating '1733/4'. This showed where the New Style 1734 started even though the Old Style 1733 continued until 24th March. ... We as historians have no excuse for creating ambiguity and must keep to the notation described above in one of its forms. It is no good writing simply 20th January 1745, for a reader is left wondering whether we have used the Old or the New Style reckoning. The date should either be written 20th January 1745 OS (if indeed it was Old Style) or as 20th January 1745/6. The hyphen (1745-6) is best avoided as it can be interpreted as indicating a period of time." Stockton, J.R. Date Miscellany I: The Old and New Styles "The terms 'Old Style' and 'New Style' are now commonly used for both the 'Start of Year' and 'Leap Year' [(Gregorian calendar)] changes (England & Wales: both in 1752; Scotland: 1600, 1752). I believe that, properly and historically, the 'Styles' really refer only to the 'Start of Year' change (from March 25th to January 1st); and that the 'Leap Year' change should be described as the change from Julian to Gregorian." B. Blackburn & L. Holford-Strevens, (2003), The Oxford Companion to the Year: An exploration of calendar customs and time-reckoning, Oxford University Press, p. 140. John Herschel, Outlines of Astronomy, 1849, p. 629. Steel, D. (1999) Marking Time. Wiley. p. 185. Excerpt viewed 22 June 2009 at http://books.google.com. Borkowski, K.M., (1991) "The tropical calendar and solar year", J. Royal Astronomical Soc. of Canada 85(3) 121-130, pp. 121-130. Synoptical Julian - Gregorian calendar Compare Old and New Style dates 1582–2100.